ON the cocktail circuit over the next few weeks? You dona��t have to limit your wardrobe to the boring black suit, not if our designers and stylists have their way. Last week, everyone from actor Saif Ali Khan to Randeep Hooda and Kunal Kapoor (working the man bun in a suit) showed off some razor-sharp tailoring and edgy designs on the runway at the GQ Fashion Nights in collaboration with Van Heusen. That was at the Grand Hyatt in Mumbai. And this weekend, at the ultimate fashion address in the capital, DLF Emporio, the La��Homme-Mena��s Weekend features India Modern accents for our men. 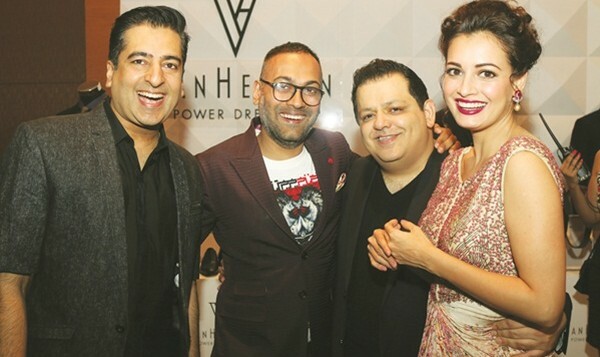 The first was curated by the GQ team, with style gurus Gautam Kalra and GQa��s Vijendra Bhardwaj on board. Meanwhile, the Delhi event will culminate tomorrow with top CEOs walking the runway in a show curated by Aki Narula. Whata��s common with both? Bold experiments with colour and style and the need to create a disinct identity informed by body type and occasion. The GQ event was a two-day tightly curated show, opened by brothers Shantanu & Nikhil, andA� followed by Troy Costa, Raghavendra Rathore, Rajesh Pratap Singh, Rohit and Rahul and new wave designers Dhruv and Ujjawal. Van Heusena��s menswear designer Vani Kannan from Bangalore showcased their in-house designs, which boldly experimented with colour, from baby blue to bright coral. a�?There are certain unwritten rules that are part and parcel of being a gentleman,a��a�� begins GQ India editor, Che Kurrien, adding, a�?but with this show, we stressed on the aesthetic, modern, contemporary, clean and minimal. Instead of fussy embroidery, the focus was on sharp tailoring.a�? Given that the magazine is a compass-like guide to mena��s fashion in the country, their brief was followed with gusto. So Shantanu & Nikhila��s The Cabinet Mission 1946 referenced the era of independence with Nehruvian aplomb. There were bandhgala coats, cropped waistcoats and buttons inspired by vintage coins. Troy Costa brought out the Parisian dandy with an easy mix of wool, leather, velvet and denim and prints that ranged from the houndstooth to blooms. Veteran Raghavendra Rathore, the prince of bandhgalas and breeches,offered ready to wear variations around the British Raj theme, but with clever touches a�� oriental details and unbuttoned sherwanis, for instance. He also had Saif Ali Khan in a black achkan, complete with pencil moustache from his upcoming movie, Rangoon. Referring to the colours of the season, Kurrien names his favourite a�� the full bodied marsala for its Christmassy vibe. a�?You can stretch the rules, pairing a jacket in marsala, with jeans, like me,a�? he says. a�?We are also seeing a lot of botanical and natural accents. As with styling, nothing is forced or fake and Ia��d say a big no to straightened hair!a�? We are expecting more to be added to the mena��s style bible tomorrow at La��Homme, DLF Emporio.A� After all, the mall is home to 74 international labels and over a 100 Indian designers. a�?Ita��s a great initiative by the team at DLF to host an event exclusive to men. With a diary packed full of special occasions, we are offering bespoke styling sessions, and our Neo Maharana line recreates the royalty of the bygone era with an abstract twist and focus on on clean-cut simplicity,a�? concludes Anita Dongre, one of the participants. a�?The last 60 years have seen unprecedented freedom, not just for women, but also for men in expressing their identity through dress, through the eclectic world of meeting of ways, of sexuality, of all sorts of things. I think the Indian male is gradually becoming style conscious and I want to create a wardrobe that any man who appreciates individual style will like,a�? says designer Tarun Tahiliani. a�?Nehru is a bonafide style icon,a�? says GQa��s Kurrien. a�?He understood the power of style and presentation, which possibly came from his background. There is strong imagery around him even now.a�? Among the gamechangers today, actor Ranvir Singh is his pick . a�?Everyone with a stylist can do it but he is extraordnary and is always different. Thata��s the sign of a hardworking man.a�?